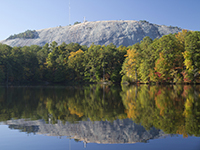 Stone Mountain and Rock City are two of the more staggering natural attractions in Georgia, while Centennial Olympic Park is a 21-acre public park that is just as beautiful at day or night. The Foreign and Commonwealth Office (FCO) advise against all travel to the breakaway regions of South Ossetia and Abkhazia, for the safety of visitors. All but essential travel to the areas near the Administrative Boundary Lines with Abkhazia and South Ossetia is also unadvised. Tbilisi, the capital of Georgia, can be accessed in a number of different ways. Flight times from London to Tbilisi can vary, with certain flights arriving in around seven hours, while others, depending on airlines and stops, can take 13 hours or on rare occasions well over. Driving or train travel, meanwhile, can require between two and three days of travel. Georgia is three hours ahead of British Summer Time and four hours ahead of Greenwich Mean Time, which which may not require major alterations to your diabetes management. Georgia has a similar climate to the UK, except summers have a tendency to be warmer, with average temperatures of around 25°C. Hot weather can lead to enhanced insulin absorption so insulin takers should be attentive in checking blood sugar levels, especially during periods of activity. The currency in Georgia is the Georgian lari, with ATMs widely available for money exchange throughout the country. There are no mandatory vaccinations required to enter Georgia, but it is recommended for most travellers to receive vaccination for hepatitis A, which can be contracted through contaminated food and water. Rabies can be found in dogs, bats and other mammals in Georgia. This is not a major risk for travellers, but vaccination is advised for people who will be working with or around animals, children, or those planning activities in remote regions that put them at risk of animal bites. You should note which syringes are available in Georgia, with U-100 syringes the most commonly used. Georgia is amongst the European countries that allow you to receive state healthcare either at a reduced cost or sometimes for free. It will cover you for medical treatment until you return to the UK. The Belgian health authority determines what treatment is considered necessary and cannot wait until your return to the UK. Georgia has a reciprocal healthcare agreement with the United Kingdom. Your passport will need to be shown as identification when purchasing medication, but it will be provided at a reduced cost or, in some cases, free. Some medical treatment will be free, but prescription medicines will normally require payment. Blood are urine testing equipment is available from most pharmacies in Georgia. The emergency services telephone number to be called in Georgia is 112. It is advisable to contact the manufacturing company of your medication prior to leaving the UK to find out what is available in Georgia if your medication gets lost, stolen or damaged. It is also worth checking to see what different names your medication may be listed as.